Dennis Rodman Conjures Similarities Between U.S. and N.K. 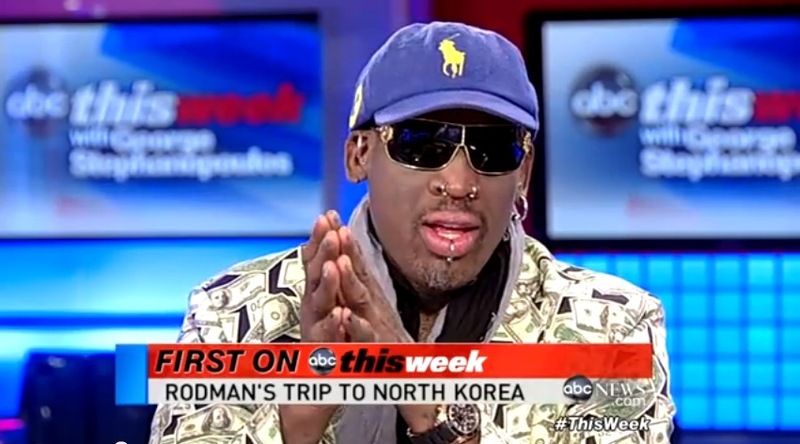 A screenshot of Dennis Rodman on the air with ABC News (photo credit ABC News). Rodman does not articulate his thoughts well. Throughout the interview, Stephanopoulos (the former Senior Advisor for Policy and Strategy during the Clinton administration, and a current member of the Council on Foreign Relations) makes his skepticism toward Rodman’s claims obvious. Rodman responds that some of the things the American government does are similar. Stephanopoulos is justifiably taken aback by this, because America does not have prison camps. It is a very different country. Although America imprisons more people than North Korea, its incarceration rate is lower, roughly seven per thousand instead of eight per thousand. One might argue that all Americans, even in prison, are freer than North Koreans. America has nothing like the torture and public executions North Korea has; instead, it permits torture and capital punishment only following due process of law, and then only rarely. Even America’s most infamous detention camp has been on the verge of being shut down for several years now, thanks to successful outcry, and few detainees die there, except sometimes when they have been detained without trial for ten years or more. Stephanopoulos is right to suggest that Rodman’s comparison is unfounded. When Rodman claims that Kim does not want war, Stephanopoulos counters by quoting Kim’s threats against the United States saying the exact opposite. Stephanopoulos sensibly conflates threat with intention (though others, like Brian Myers, would perhaps argue that Kim must threaten war with the United States to legitimize his government). The minor details we can glean from Rodman’s words are of little use. We can tell, for instance, that Kim Jong-un has enough charisma to convince the people who meet him that he’s a great guy. What good is that? Since Kim is not actually a great guy, this fact is not worth exploring. Second: according to Rodman, Kim is willing to say that he wants to talk to President Obama. This should probably be discredited as well; after all, as Stephanopoulos points out, if he really wanted to talk with Obama, he could just pick up the phone and call him. Best to discount it, as Stephanopoulos does.